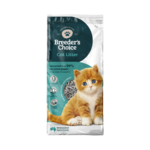 99% recycled, for an environmentally friendly litter The first choice for many Pet Circle customers, Breeders Choice cat litter is a long-lasting, odour-absorbing paper litter that is free from additives and chemicals for a natural litter under your cat's paw. This is kitty litter with a conscience! Biodegradable, compostable, highly absorbent and natural odour control - you can see why Breeders Choice is such a top choice! Buy natural Breeders Choice cat litter online at Pet Circle and enjoy the convenience of delivery straight to your door, always at the best price.